Mexico City is one of the most exciting cities in the world right now. Its modern architecture, new museums, trendy restaurants, and accepting LGBTQ scene has drawn people not only south of the border, but away from the beaches. The latter is harder than you might expect. So you’re heading to Mexico’s capital to see what all of the fuss is about. But instead of heading straight for a grand opening, you’re stepping back in time for your first adventure. The Valley of Mexico was once filled with water. The Teotihuacan, Toltec, and Aztec peoples lived among its extensive lake and canal system. It was full of fresh and brackish water, marshes, and chinampas (floating gardens). Mountains and volcanoes surrounded it. Then the Spanish arrived in the 16th century. Tenochtitlan was renamed Mexico City. As the city grew, the surrounding water—and its importance—drastically decreased. What’s left of it is Xochimilco. 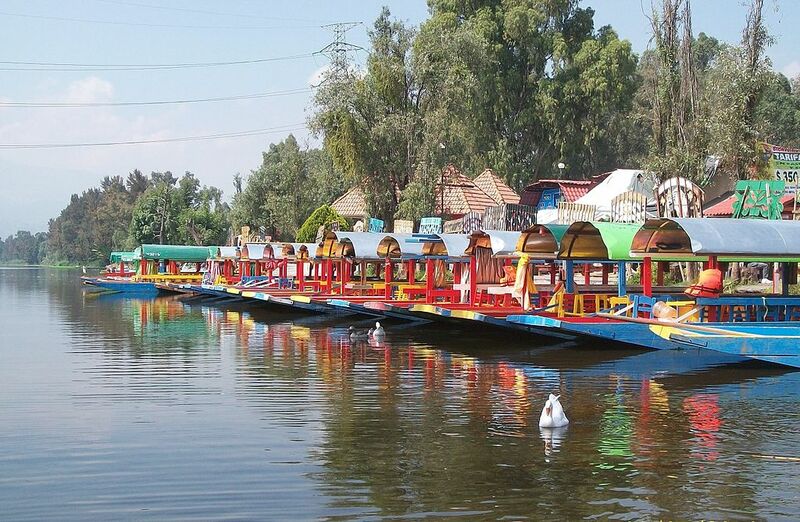 Though Xochimilco feels like a small village outside of the city, it’s actually one of Mexico City’s 16 boroughs. It’s also a protected UNESCO World Heritage Site. Xochimilco is the last stop on the Xochimilco Light Rail; it’s a 90-minute ride from the city center. You arrive to find the San Bernardino de Siena Church, a church and a monastery that the Spanish built after their conquest of the Aztec Empire. A large plaza is surrounded by brightly colored buildings and street vendors selling ice cream. Everything from blue corn tortillas and dried chilies to christening gowns and clay pots are sold in the traditional market. Plus the canals, at least all that remains of them, are a popular place for locals to hang out on Sunday afternoon. You understand why as soon as you see the trajineras lined along the edge of the water. These flat-bottom boats look like Mexican gondolas. They’re painted in bold colors and are named after female relatives. Some carry food, from quick roasted corn on the cob and nieve (shaved ice) to simple meals like Oaxacan cheese quesadillas and acociles (crayfish with lime juice and chili powder). Others are full of musicians—marimba (a percussion instrument) players, mariachi trios, and small bands. Most, like yours, glide along the water in search of the chinampas, the Island of the Dolls (which is somehow both charming and creepy), and a cool breeze. You spot migratory birds, who use the wetlands for nesting, as you pass the marshes. Fish jump out of the muddy water along the side of the boat. While an axolotl (a Mexican salamander), with its lidless eyes and external gills, might be the strangest amphibian you’ve ever seen. And this is supposed to be the dullest part of your Mexico City trip.